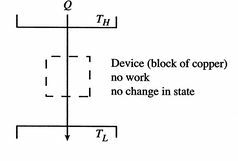 Heat transfer from, or to, a heat reservoir. The second law says that the entropy change must be equal to or greater than zero. This corresponds to the statement that heat must flow from the higher temperature source to the lower temperature source. This is one of the statements of the second law given in Section 5.1.
which is not possible. The second law thus tells us that we cannot get work from a single reservoir only. The ``only'' is important; it means without any other changes occurring. This is the other statement of the second law we saw in Section 5.1. This is the entropy change that occurs for the free expansion as well as for the isothermal reversible expansion processes �- entropy changes are state changes and the two system final and end states are the same for both processes. so the process is not reversible. ; the equality between and is only for a reversible process. The quantity has a physical meaning as ``lost work'' in the sense of work which we lost the opportunity to utilize. We will make this connection stronger in Chapter 6. The heat transferred from the surroundings, however, is equal to the heat received by the system: . The reversible process has zero total change in entropy.